Queens lost for the 4th successive time in all competition after going down to a late goal from Kyle Benedictus at Kirkcaldy today. It was rough luck on James Fowler`s side who had given as good as they got in a fairly even contest but a defensive lapse at a corner proved costly. 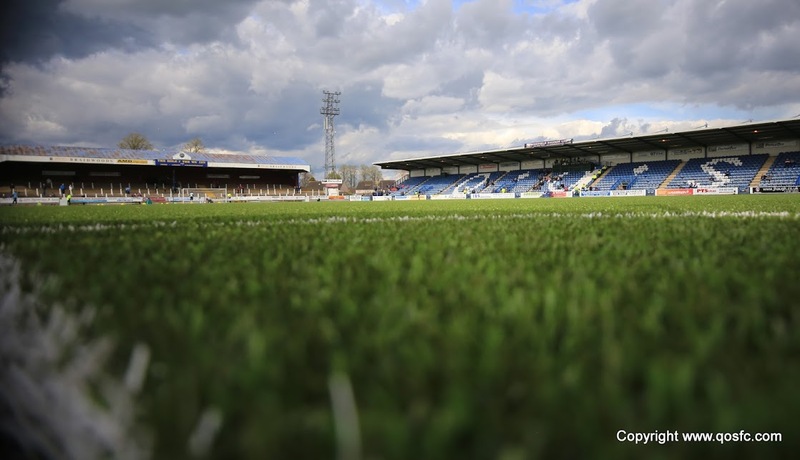 Fowler made two changes to the starting line up beaten by St Mirren last weekend as Gary Oliver made his first start in place of Aidan Smith who dropped to the bench whilst Mark Millar had an achilles problem and missed out altogether, Alex Harris returning from injury in his place with Ryan Conroy taking a more central role. Like ourselves, the home side had a summer of upheaval. 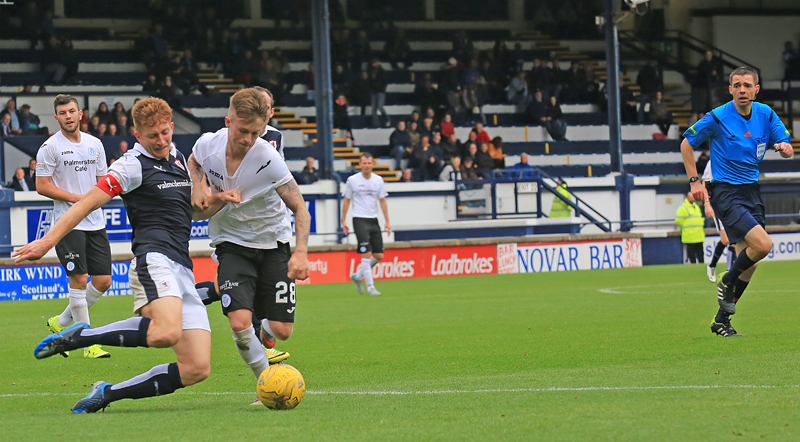 Both sides started the match with 7 new players since the last meeting, though of course one of those had simply swapped sides with Conroy having made the move from Starks Park to Palmerston in the summer. 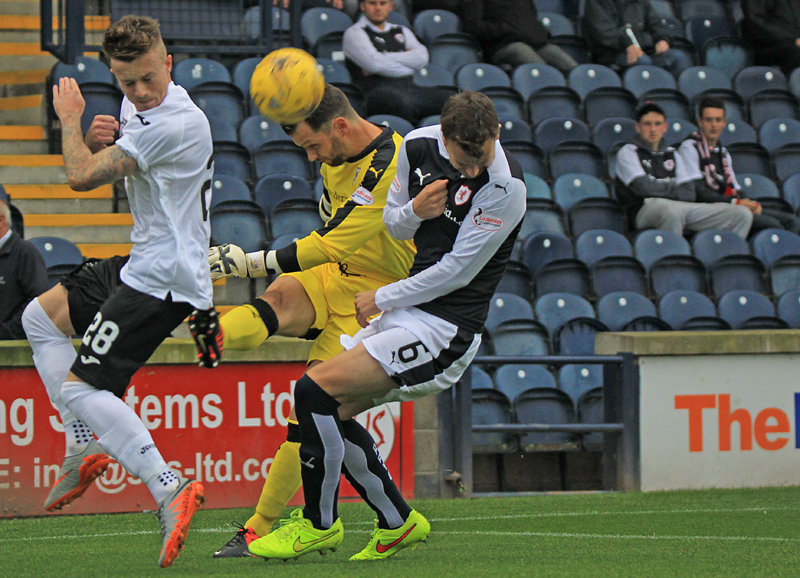 Raith started sharply with both Grant Anderson and Ryan McCord having earlyshots blocked but Queens were soon on the attack themselves and Cuthbert had to move sharply to parry away Conroy`s 12th minute free kick. Alex Harris` rebound was scrambled away from goal but the on loan HIbs winger was given offside anyway. 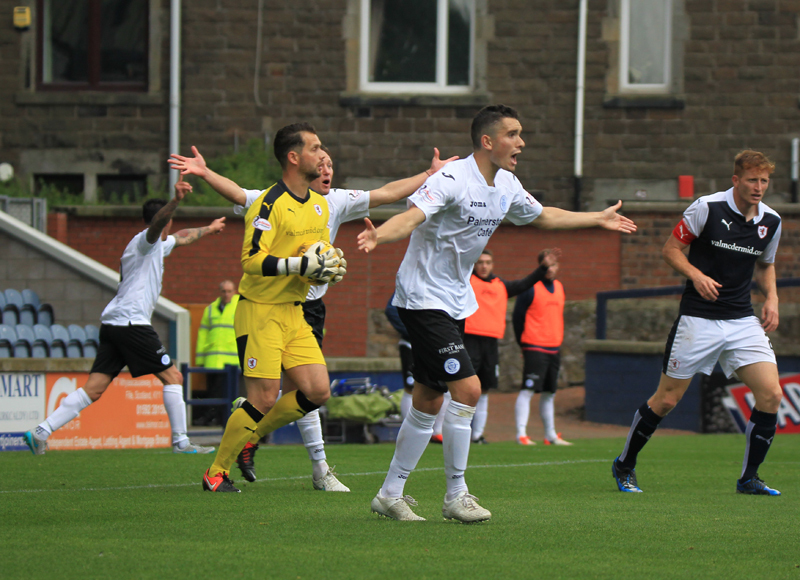 Midway through the half, from Darren Brownlie`s excellent cross, Gary Oliver flashed a header just wide of the post as the wrong-footed Cuthbert could only watch helplessly. However, soon after it was Queens turn for a let off as a cross from the right was headed narrowly past the post by Grant Anderson with Thomson this time the one only able to watch. The sides swapped yellow cards as Ryan McCord was booked for a cynical trip on Russell before Chris Higgins reckless lunge at Jason Thomson out by the touchline earned a similar fate. Immediately before the interval Andy Dowie headed Ryan Conroy`s corner goalward but Cuthbert saved low to his left. Queens began the second half in the ascendency with Gary Oliver firing a shot wide from just inside the box and then Kyle Jacobs hitting an early strike from distance just beyond the top left corner. There were also big claims for a penalty when Lewis Toshney appeared to handle the ball in the penalty area. 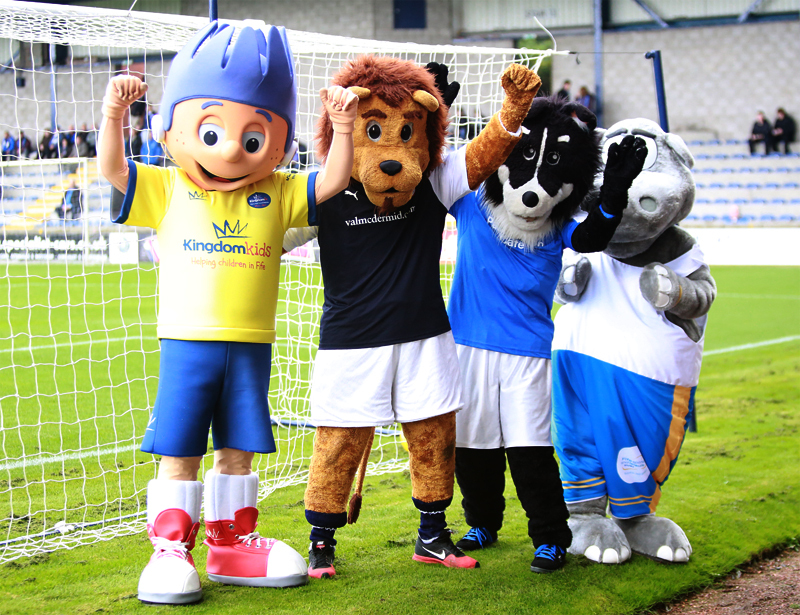 Ominously though Rovers were starting to look a threat at set pieces and Jon Daly headed a corner just wide. 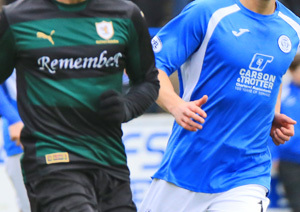 Rovers replaced McCord with Mark Stewart before their captain Jason Thomson became the second player to be booked for a cynical challenge on Russell. It was looking more and more like it would be a set piece which proved the difference. 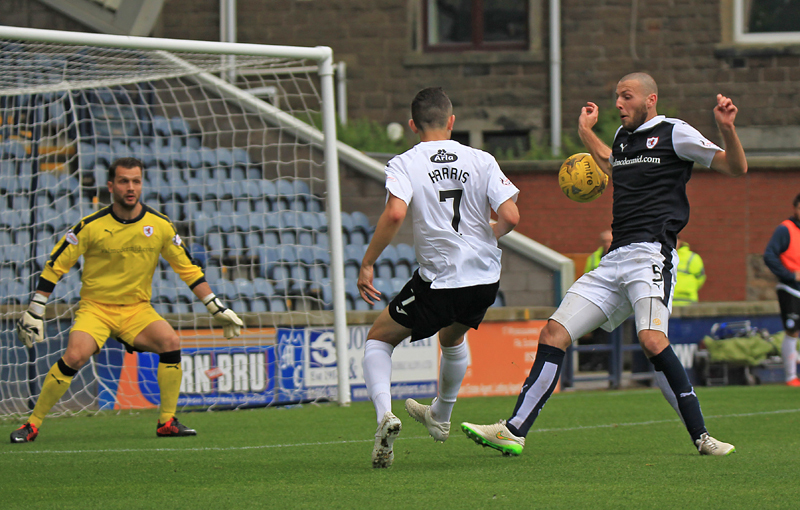 First Iain Davidson rose well above everyone else to power a header over the bar at a Rovers corner and then, after Kyle Hutton had replaced the limping Alex Harris, Andy Dowie`s header at goal from a Conroy corner was brilliantly tipped over by Cuthbert. Iain Russell pulled up with injury soon after and was replaced by Lewis Kidd who went to the right of midfield with Ryan Conroy switching to his third different position of the afternoon on the left side. The home side made a double switch when Matthews and Megginson replaced Anderson and Wighton and almost immediately made the breakthrough. Chris Higgins averted the danger from a cross when he nodded the ball out for a corner but when the delivery came in from the right side Kyle Benedictus somehow was left with all the time and space he needed to power in a header from about 10 yards out in a central position. Queens immediately sent on a extra forward, with Aidan Smith replacing Kyle Jacobs but it was Raith who should probably have doubled their advantage soon after when Daly too found space in the box at a corner but his header bounced up and over the crossbar. The former Dundee United and Rangers man soon found his name in referee Kevin Clancy`s book too for a late challenge on Higgins whilst Jason Thomson was perhaps a little fortunate not to see a second one for throwing the ball 20 yards away after conceding a late throw. The home captain was however required to sit out most of the last couple of minutes whilst blood was cleaned up from a facial injury. As the clock ticked through four minutes of injury time Queens forced a succession of corners, Ryan Conroy had a shot go wide and Cuthebrt made a save from Oliver, who also had a shot charged down by a defender soon after but the home side held on to their winning position. So after winning their opening three league fixtures, it`s three defeats on the bounce and Queens drop into a logjam of clubs in midtable, 6th place but behind Raith and Morton on goal difference. It`s important now that we bounce back at home to Morton next week and gain some revenge for the recent League Cup exit at the hands of the same side.